It’s the end of civilisation as we know it – or possibly just in my world! The hard drive on my laptop has been fried. And wouldn’t you know it; Ahmed had a “friend” who had a computer shop. Ahmed,a trifle vexed by my constant whingeing, promptly drove me to the shop. I should point out that I have now become accustomed to his erratic driving style and no longer need a sedative before accompanying him on any journey. The shop was located in a side street and had the obligatory elderly Turkish men sat outside on plastic chairs drinking çay. As we arrived, a huge vested hairy man came out of the shop carrying a rather large hammer in his hands, which were the size of shovels. “Not a chance” I thought and turned to get back in the car, however, Ahmed clearly had other ideas and pressed on laptop in hand. Not having the same emotional attachment to my Tosh, he did not share the same reservations as I. It was then I realised that it was quite possible that I loved my Tosh more than him. Once inside the dusty little shop, I realised there was no going back. Although, small there were shelves overflowing with computer parts, in fact, every possible surface was covered with some circuit board or other. Ahmed placed my Tosh on the counter and the big man plugged it in and started it up, a Turkish roll-up dangling from his lips throughout. He was neither a big smiler, or a big talker but that was okay if he had magic computer fixing fingers. Having switched my mean machine on, he spoke with Ahmed, who in turn translated “laptop broken”, which didn’t exactly fill me with confidence. As I turned to leave I had this overwhelming urge to run back and say to him “If you damage my baby in any way, I will have to come back and seriously hurt you”. Images of me being restrained by Jandarmes (and not in a Fifty Shades of Grey kinda way either) prevented me from acting upon my impulses. As we drove off I wondered how we could raise funds for another laptop if Ahmed’s friend was unable and/or incapable of repairing my laptop. I briefly contemplated the fee I would earn if I were to sell Ahmed on Ebay and disregarded it immediately, realising it would be unlikely that I would get enough for a wireless mouse and a wrist rest. Ohhhh, scary! I hate when that happens. And it did happen to me too, only a very short time ago as you would have read on my blog. I so empathize! Good luck! Bless you – I’ve lost all my photos and I’m not exactly convinced that the guy is going to fix it – but insallah as they say here! Have a fab weekend! Ouch, that is horrible. Well insallah then and hope to see you next week! I know the feeling well. I hope they are able to fix your computer for you, it’s times like these you think about all the things that should of been backed up, I was lucky and I got everything that was on my old computer transferred to my new one, now I keep most things on a memory stick. Memory sticks are less reliable than hard drives. The best back up is off site. I regularly backup my stuff by emailing it to myself at different web mail accounts so it’s backed up in at least two places. Encrypt them if you want. There’s also sites like dropbox and syncplicity where you can store documents. Thank you and its nice to know that at least my fellow bloggers feel my pain! 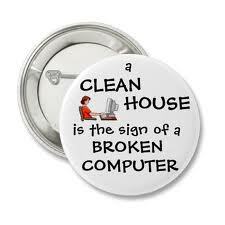 I agree, a clean house is a sign of a broken computer. Our men wonder why we like our computers better than them at times. Our beloved computers do not mess up the kitchen, make us crazy when driving, leave dirty clothes in the bathroom or lose things when they are working correctly. If they fix the computer and I sincerely hope and pray that they do, invest in one or more memory cards and backup constantly to them. Leave nothing on your hard drive that isn’t backed up. So far I’ve left a trail of broken down computers behind me. Laptops are not as tough as desktops and I swear the next computer will be a desktop. I still keep an old HP desktop, so old it still has floppy drives, handy in case. It still works although it was bought used in 2001. Good luck! Well said and I agree with you regarding the desktops but unfortunately, here in Turkey ‘needs must’. Thinking of you! İt’s worse than loosing your arms when you’ve no comp – cut off from the world or somehow worse when you are living abroad. But here’s a bit of hope 🙂 whenever there’s something broke here and Mehmet ‘has a friend’ they usually can fix it 🙂 even the most unlikely looking ‘friend’. Fingers crossed. Hope to hear from you soon. Geçmiş olsun! Thank you for the reassurance and I do feel a little isolated but its been nice picking up my messages this morning! Just love the badge – so so true! Trust me if I could get one, I would be wearing it now! 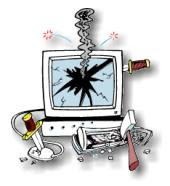 ooph – broken computers are the worst! I remember when mine shut down in college – after that I definitely got myself a hard-drive. Good luck with it! So sorry! I just had to replace my hard drive, but it’s better than the alternative, which is too terrible to contemplate. Good luck! Very sound advice and far easier than purchasing a memory stick here in sunny old Turkey! With all this going on and you still had time to pop in and ‘like’ my post… thank you for popping by and good luck with your challenges… ciao! Nightmare! Me and technology are unhappy bedfellows. My “reader” on WP doesn’t want to play with me at present. Hardly dare look this morning in case it’s still sulking. I’ve been having big problems with the reader and my notifications as well! Although in the big scheme of things I suppose it’s quite minor, good luck with your reader and happy Sunday! Best of luck with that! I now use a back-up hard drive…glad I have it as I had another crash and was able to rescue everything. To restlessjo when my reader wasn’t playing nice with me I did a couple of things. I emptied all my temporary files to clean up memory. I do that daily before I start using WP. I also downloaded Google Chrome. WP support says it’s the best browser to use. I haven’t had as many issues now that I’ve done this. Hope that helps. When (and if) I get it back, I will be giving that a try! double drat! 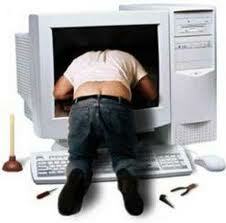 Nothing worse than a computer crash…ok, well, maybe there are worse things, but it’s still a drag. If I don’t get it back soon, my sanity is going to be at grave risk (or maybe that ship has already sailed)! glad youre still able to get to “the keys” despite the computer meltdown. i must say that i have a dell and its proven to be nothing but a tech night mare. i do hope that they fix it for you asap. sending my best to you and the repairman. keep us posted…. Nothing comes between me and my Mac! What a nightmare… I hope it all turns out. Do you think I should say a prayer? If my laptop doesn’t make it (sob) I will be holding a memorial service! Ooooh… that’s awful. Sorry you’re going through this. Hope it’s a quick, easy, and cheap fix!! oh me gosh! What a nightmare!! 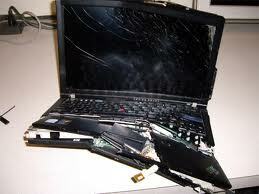 I hope that image of the shattered laptop is not the current (or future) condition of your Tosh!!! keeping my fingers crossed for a speedy recovery! I’ll tell you how I fixed my computer problems…… I bought a Mac 🙂 Sorry to hear of the crash. Hope you’re up and running again soon. I’m now beginning to climb the walls! Good luck! Being computerless is definitely difficult, particularly as you usually immediately thing of an email you just have to send or something you need urgently to look up on Google. Sigh.